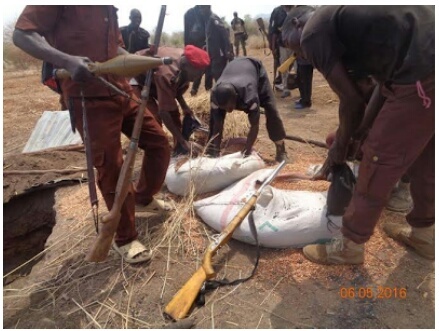 As the ongoing clearance and rescue operations gain momentum, troops of 28 Task Force Brigade have successfully cleared enclaves of Boko Haram terrorists along Galtha Baba, Galtha Musa, Bulakurma, Shatimari, Chukruk, Bulangaje, and Disa villages. During the operation, one Boko Haram terrorist was captured alive and 3 motorcycles, bags of grains, their flags and uniforms were recovered. Other items include suicide bomber’s hijab, mobile phone and 1 Dane gun, as well as foodstuffs and cooking utensils. The troops also rescued 15 persons that were held hostages by the Boko Haram terrorists in the area. Unfortunately, two armoured fighting vehicles (AFVs) entered an Improvised Explosive Device (IED). However, the formation did not sustain any human casualty and the damage to the AFVs was minimal. The captured terrorist is being interrogated and would soon be taken to the relevant agencies for prosecution.